BMC sweeper Sunil Yadav said, who secured MPhil degree. 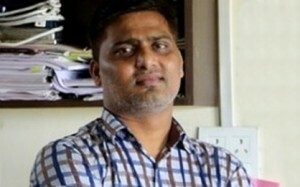 Mumbai, May 6 (PTI) Beating all odds, 36-year-old Sunil Yadav, a street sweeper employed with the Brihanmumbai Municipal Corporation (BMC) today swept his way to success by securing an MPhil degree from Tata Institute of Social Sciences (TISS) here. Yadav, who is deployed at Nana Chowk in Central Mumbai for the cleaning job, now aims to pursue a PhD degree to understand the problems plaguing the sweeper class and wants to find solutions to it. “I am elated on securing my MPhil. By doing PhD, I want to deeply study the social system that has marginalised our (sweeper) class in the society,” Yadav, who secured seventh rank in his post masters’ degree with ‘Globalisation and Labour’ as the subject told PTI after the convocation ceremony today. Even after securing a good rank, Yadav wants to continue with his job as a sweeper. “I am not going to leave this job. Rather I will continue to work for the BMC. I am not interested in any corporate job. Instead, I want to empower my fraternity in understanding their rights and fight for it. I want to be the voice of the down-trodden to wipe out all sort of discrimination within the society,” he said. “I then realised there was a hunger inside me to pursue my education. I lived in a slum in Mahalaxmi where gangsters were common place. That played havoc on my studies but I did not budge and continued,” said Yadav, a father of two school-going daughters. Yadav, who has now settled in Chembur said that after passing SSC and HSC, he did his B Com and followed it up with a bachelors degree in journalism and masters in social work simultaneously in 2011. But all this was not a cakewalk as he had to face departmental hurdles when he decided to go for higher education. “Our officers consider us as bonded labourers. They put forth all the hurdles which show how society still treats us and wants to suppress us rather than help us,” said Yadav, adding that he took inspiration from Baba Saheb Ambedkar to achieve the feat.